When B.J. 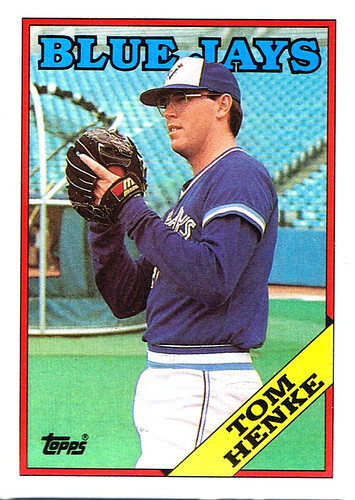 Ryan went down about a year ago, I wrote a little tribute to Tom Henke. He is, after all, my favourite Toronto Blue Jays pitcher of all time. When I was growing up, the first thing I'd read in the newspaper was the box score from the previous night's Blue Jays game. Baseball is all about stats, so I'd monitor each pitcher's ERA, SOs, BBs and IP. Read this quote from the 88 Topps blog and tell me if you know what an ERA+ is. Henke was an absolute stud. He had a rough 28 innings in 1984, but otherwise the rest of his career was stellar. After 1984, the lowest ERA+ he posted was 127, and he finished at 156 for his career. Here is the full list of all pitchers in history with at least 700 IP, a WHIP under 1.1, and ERA+ over 150. Just four guys. The other guys are all HOFers, probably. Yes, John Cerutti's card was there. You can fool most people some of the time but not all most of the time. A glitch on your part - thats OK. You are to worried about the storm - already started here in Bolton. The Terminator thats all that needs to be said. Cerutti was a good guy, but he was no Terminator. There's something about an Aqua Velva man. Probably BP or spring training unis. I, too, recall the Aqua Velva commercials. Man that Ward/Henke combo we had for those few years was lights out, too. Good times. Yeah, I think Topps took all their pics during spring training. This is where you should have inserted The Ballad of Tom Henke, a Wilkinson family favourite. "You can bring him in now, but he's even better later...."